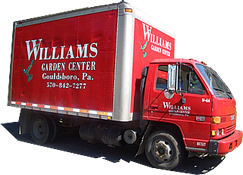 Started by the Williams family in the 70's, building a reputation for service, dependability and reliability, serving the residential and commercial needs of northeastern Pennsylvania. With our first location along Route 307 in Daleville, we began to grow, striving to meet the need of our growing customer base. By the early 80's, we needed a larger location and moved ot the intersection of Routes 307 & 435 in Daleville. In the past 35 years we have become this areas largest landscpa/excavation firm offering a large selection of products, with a knowledgeable, firendly staff, eager, to serve. We also design and install residential and commercial underground irrigation systems, retaining walls, patios and water features. Our excavation team offers site work of all inds, grading, terracing, drainage work and septic systems. Our garden center offers this areas largest selection of trees, shrubs, perennials, bulk topsoil, mulches andstone. Our reputation earned by years of hard work, attnetion to detail, knowing how to listen to our customers, anticipatethier needs and exceed their expectations, is something we are proud of. We are proud to serve all our cusomters an eager to meet the needs of new ones. No matter how large or small we have the equipment, materials and expertise to fit your needs.